financial transformation in your life! so that you can build your fortune"
It is my desire that your life's dreams manifest for you. With the 'success systems' available for you here at the Empowered Millionaire Institute, I feel confident that I can show you how to become a millionaire and be healthier and wiser and happier... all at the same time. 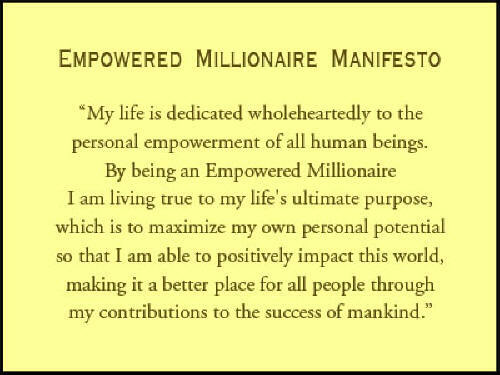 You have my personal commitment in that I have put more than two decades of my most earnest effort into writing and creating the multitude of empowering and success-creating materials that constitute the Empowered Millionaire personal improvement programs, starting from 1996. Therefore, I am confident to give you my 100% personal satisfaction guarantee. Please know that I am here to assist you on your journey to success in any way that I can be of service to you. Yes, you have my personal guarantee that I will do my best to help you attain the lifestyle that you believe you deserve to have. Please remember to always say yes to success. And I'll see you somewhere in the world soon. More power to you for a fabulous life.